On the 6th of January 2017, Global Leaders in Construction Management embarked upon a pleasant office visit. We were greeted by William Yong, over projects in the Southeast Asia region and Geoffrey Piggott, the deep tunnel sewerage system project director. 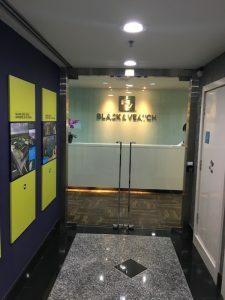 William Yong began the office visit with an overview about Black&Veatch(B&V). Black&Veatch strives to build a world of difference and to make an impact on the people they work with. Black&Veatch has served the Singapore government for around 104 years. Also Black&Veatch has a yearly revenue of about 3 billion USD. 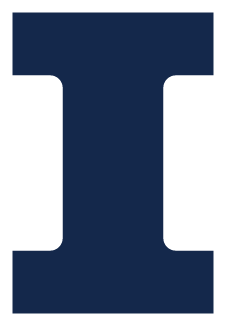 Moreover Black&Veatch has numerous business sectors: power, water, telecommunications, management consultant, special projects(design-build, security, disaster support), and oil and gas. Power is their leading sector with around 1.7 billion USD in revenue, followed by the water sector. After an overview of the company we were informed about how safety is a major priority to Black & Veatch. 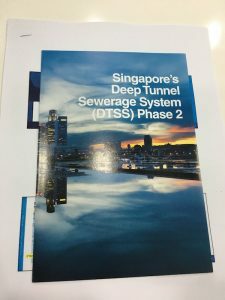 Following the overview and safety measures we learned more about a current project of Black & Veatch known as the deep tunnel sewerage system or (DTSS). This project is an addition to the first phase in order to free up land for other higher value development and to support the production of NEWater. The project is estimated to lasts about 10 years and is currently in its 3rd year, beginning of construction. Singapore has 4 national taps of water: local catchment water, water from johor, NEWater, and desalinated water. Two-thirds of Singapore’s land area serves as catchments. NEWater serves about thirty percent of current water needs and is estimated to be around fifty-five percent by 2060. The desalinated water serves about twenty-five percent of demand. In addition some water supplied to Singapore will be cut-off therefore Singapore will have to be self-sufficient. The water system used before DTSS included 6 water reclamation plants (WRPs) and over 130 sewage pumping stations. However, the benefits of using the DTSS are that it is more cost effective, it frees up valuable land, ensures sustainability of NEWater , and that it is robust, reliable, and resilient. There are also three main focus areas for the DTSS Phase 2: Deep tunnel sewerage system, tunnel and link sewers, and Turas WRP. The deep tunnel sewerage system has long term sustainability and resilience of 3-node system. 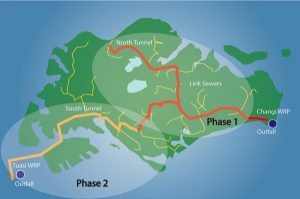 The tunnel and link sewers is sized adequately for the long term and is designed for maintenance and resilience. The Turas WRP is energy self-sufficient, requires less manpower, includes advanced treatment with NEWater production and is in Co-location with IWMF within limited footprint. B&V teamed up with AECOM to pursue the DTSS project. The project was awarded on April 2014. The contract fees alone were around 80 million USD. The team member included professionals from Singapore, Malaysia, UK, Australia, US and many more. There were 2 senior reps of each company on the JV Board, and key professionals were drawn from around the globe. The design of the tunnel is very unique. The cylindrical cross-section included several layers: concrete segmented tunnel(outermost), MIC Resistant Concrete(second layer), HDPE lining(innermost layer). The cross-section also included a fiber-optic strain monitoring for structural integrity. This was embedded in the tunnel lining to detect movement in the tunnel. In addition the tunnel included a drop structure, air jumper(used to force air into the tunnel), and roller gates(allows for bypass and flow diversion at intermediate shafts). 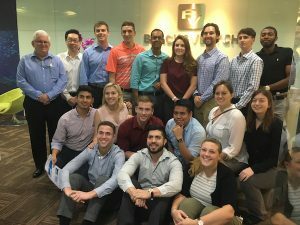 All in all Global Leaders in Construction Management thoroughly enjoyed the visit and would love to learn more about B&V, thank you.